Nowadays, when the number of online traders is growing very fast, the need for a good book is obvious. Larry's new book provides a unique combination of professionalism and simplicity, presented in an easy-to-read style. This kind of book is currently in short supply. Larry writes about real trading situations, explaining how to reduce risks and enhance returns. The book contains practical examples and explanations how to handle the various scenarios that might arise. I feel comfortable saying that this is the best practical manual for swing trading that I have ever read. His focus on short-term (swing) trading is very understandable. In the current, turbulent market environment, many people consider "buy-and-hold" investing to be an outdated strategy. However, they are not sure what else to do. Swing Trading offers a real opportunity to produce profits while keeping risk under control. The algorithms that Larry uses in SwingTracker are great at identifying swing trading opportunities - they are extremely valuable to both beginners and experienced swing traders. 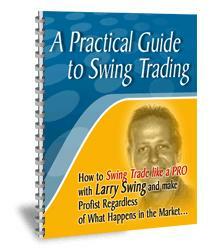 Larry covers the whole process of swing trading, from soup to nuts. He even recommends brokerage firms that have features which are particularly useful to swing traders. Not only does this book introduce a set of helpful tools and tips, it describes way of thinking about trading and philosophy that allows the reader to feel confident about swing trading which leads to success and profits.